Hurry! You can score a FREE Popular Science Magazine Subscription! 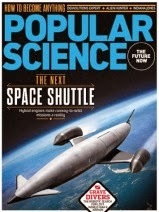 Popular Science magazine is one of the nation's oldest and most influential magazines on trends in the scientific world. It provides a way for you to stay updated on the newest technology, inventions, and theories that affect our world today. Popular Science magazine also has many practical and insightful news stories that every household can use.